The problematic of biopolitics has become increasingly important in the social sciences. Inaugurated by Michel Foucault’s genealogical research on the governance of sexuality, crime and mental illness in modern Europe, the research on biopolitics has developed into a broader interdisciplinary orientation, addressing the rationalities of power over living beings in diverse spatial and temporal contexts. The development of the research on biopolitics in recent years has been characterized by two tendencies: the increasingly sophisticated theoretical engagement with the idea of power over and the government of life that both elaborated and challenged the Foucauldian canon (e.g. the work of Giorgio Agamben, Antonio Negri, Roberto Esposito and Paolo Virno) and the detailed and empirically rich investigation of the concrete aspects of the government of life in contemporary societies. Unfortunately, the two tendencies have often developed in isolation from each other, resulting in the presence of at least two debates on biopolitics: the historico-philosophical and the empirical one. This Handbook brings these two debates together, combining theoretical sophistication and empirical rigour. The volume is divided into five sections. While the first two deal with the history of the concept and contemporary theoretical debates on it, the remaining three comprise the prime sites of contemporary interdisciplinary research on biopolitics: economy, security and technology. 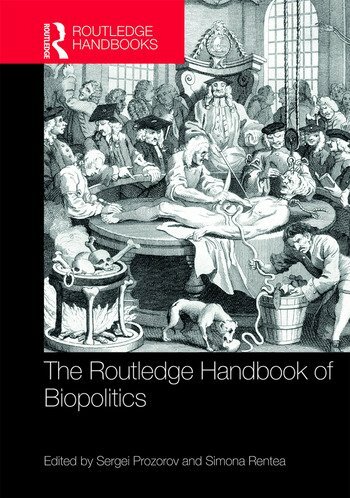 Featuring previously unpublished articles by the leading scholars in the field, this wide-ranging and accessible companion will both serve as an introduction to the diverse research on biopolitics for undergraduate students and appeal to more advanced audiences interested in the current state of the art in biopolitics studies. Sergei Prozorov is University Lecturer in Political Science at the Department of Political and Economic Studies, University of Helsinki, Finland and Principal Investigator in the Academy of Finland project Biopolitics and Democracy in Global Governance. Simona Rentea is Assistant Professor in International Relations at Saint Louis University, Madrid Campus, Spain. Her research addresses the biopolitical inflections of the current articulations of international order, the relationship between science and politics, and the role of emotions in politics.